Between September 18th and October 1st 2011, the field trip of the Institute of Mining Engineering I (BBK I) brought 14 students and research assistants under the direction of Prof. Martens and Dr. Rattmann to several locations of the Irish and British mining industry. Beside underground and open pit mines, visits to the Geological Survey of Ireland, a production site of Joy Mining Machinery, the London Metal Exchange and the Headquarter of Rio Tinto in London were part of the schedule. 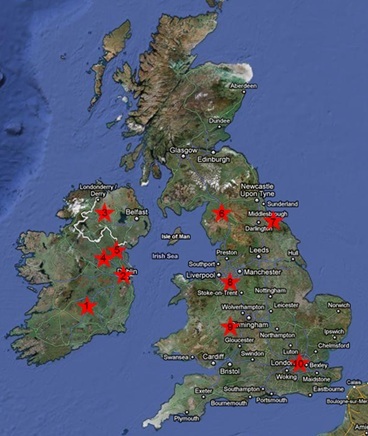 The focus of the first week in Ireland was with Lisheen Mine (1) and Tara Mine (4) on underground lead-zinc-mining. A highlight of the field trip was the visit of the Tara Mine near Navan, which is operated by the Swedish mining company Boliden AB. With 2.6 million tonnes of ore it is the largest zinc mine in Europe and of the largest in the world. The Omagh Gold Mine (3) is situated in Northern Ireland. At the moment the ore is mined in an open pit but the planning of an underground mine is underway. Additionally, the group visited the Geological Survey of Ireland (2) in Dublin and the Knocknacran Gypsum Mine (5). The second week of the excursion started with the transit via ferry from Dublin to Wales on September 24th. With visits of the Boulby Potash Mine (7) and the Winsford Rock Salt Mine (8), the second week had an emphasis on underground salt mining. In both mines the ore is mined by Continuous Miner. Currently potash (potassium chloride) in Great Britain is only mined at the Boulby Mine. 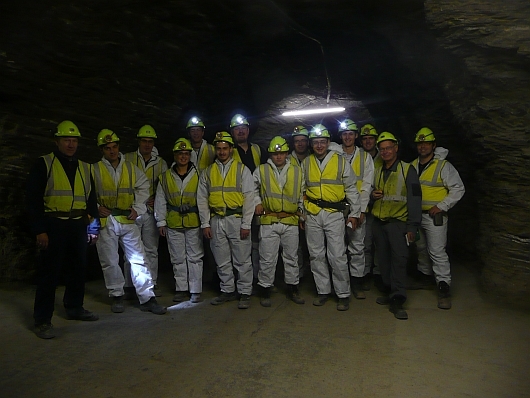 Furthermore, the group visited Birkshead Mine (6), an underground gypsum mine. At the end of the field trip the group visited the production site of Joy Mining Machinery in Worcester (9) as well as the Headquarter of Rio Tinto Group as well as the London Metal Exchange in London (10). Beside the technical focus of the field trip, the cities of Dublin, Manchester and London offered some time for cultural sightseeing. The field trip report gives an extensive overview of visits, experiences and impressions which the participants gained during the two weeks.